After 20 months of construction, the new Allan Price Science Commons and Research Library debuted in October to rave reviews. The library had been hidden from sight underneath a concrete courtyard for decades. And it had long since outgrown its space, due to a 72 percent surge in the number of science majors over the last 15 years. The new 40,000-square-foot commons offers a breath of fresh air for science students and faculty members. It contains an abundance of classrooms and study spaces (including discipline-specific rooms for biology, chemistry, computer science, human physiology, geology, and physics); a modern “makerspace”; an impressive data-visualization lab created for viewing huge data sets; and a light-filled commons area that rises above the concrete plaza between Willamette Hall and Onyx Bridge in the center of the Lokey Complex. 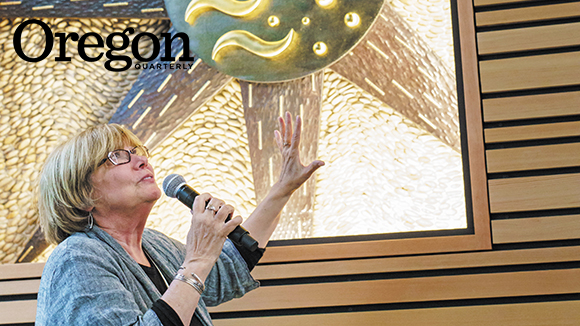 The renovation was kickstarted by philanthropist Lorry Lokey with an $8 million lead gift in memory of Allan Price, the former UO vice president responsible for unprecedented growth in private philanthropy from 2001 to 2008. In 2014, the Oregon Legislative Assembly put the project on a fast track with approval of $8.375 million in general obligation bonds, rounding out funding for the long-needed upgrade. “It’s a gorgeous testimony not only to Allan but to the growth of the University of Oregon,” Lokey says. At the building’s grand opening, UO officials, the library staff, students, faculty members, donors, and volunteers were treated to the unveiling of an original artwork by Susan Price, Allan Price’s widow, who collaborated with Eugene glass artist John Rose (with assistance from artists Randy Ortiz and Sandy Tilcock) on a work called Rise. The piece draws from the Chinese tradition of the five elements of nature, with a representation of the sun placed on a swirling bed of river stones, and incorporates symbols of wood, fire, water, metal, and earth. The commons was designed by Opsis Architects to support the UO’s mission of interdisciplinary integration in the sciences. In the past, libraries emphasized quiet spaces for individual study. While the new facility still has those areas, it also provides numerous open areas for collaboration along with access to a range of information from all scientific fields and sources. It is expected to achieve Leadership in Energy and Environmental Design (LEED) Gold certification. Among the new features is the Robert DeArmond MakerSpace, outfitted with a laser cutter, 3-D printers, crafting tools, and computer software. The space is open to all students on campus. The data visualization lab is the only place in the state of Oregon where groups can view full resolution, 50-million-pixel images on a huge screen that is 20 feet wide and eight feet high. The lab allows researchers to gain new insights into huge datasets, build 3-D simulations, and explore vistas ranging from nanoparticles to vast expanses of outer space. The building also has a courtyard, and the commons area boasts a coffee shop named the Elements Ca-Fé. The spelling of the name reflects the abbreviations for the elements calcium and iron, a nod to its location at the heart of the UO’s science community. The Price Science Commons and Research Library is part of the seven-branch UO Libraries system, which is the state’s largest research library.